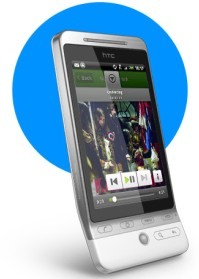 Aside from paying an upfront cost for the HTC Hero, I think that’s a pretty good deal. My only real reservation is that I don’t like the move towards 24 month contracts, not because I particularly like to switch carriers but, being the early adopter I am, I like to upgrade my handset as soon as possible. On the other hand, for many users, a 24 month contract maybe a little easier to swallow while the music keeps playing. 3 have also hinted that the Hero is only the first handset to be offered with a bundled subscription to Spotify, and with a Symbian/S60 mobile app for the service just around the corner, I expect a range of Nokia phones on 3 to soon to be included. As for the whole ‘feels like free’ mobile music space, 3 and Spotify’s offering will inevitably be compared to Nokia’s Comes With Music, which hasn’t exactly set the world on fire. However, CWM doesn’t offer a free version to hook users in and utilizes DRM in a much less user-friendly way. While Spotify does employs DRM, because it’s cloud-based (either streamed or cached rather than traditional downloads), the service can much more easily be used across multiple devices, Windows PC/Mac and on supported handsets. ordered this deal on the weekend. just waiting for phone delivery. managed to get the £99 upfront charge waived and I got recommend a friend, so another £30 back.